The book was a big hit. Great condition and quick shipping. THIS BOOK IS ONE OF MY FAVORITE LOVE STORIES AND EACH TIME I READ IT(YES I HAVE READ IT MORE THEN ONCE) IT MAKES ME CRY AT THE END BECAUSE IT IS SUCH A HAPPY LOVE STORY. THIS IS A MUST READ FOR ALL SPARKS FANS. An amazing love story. Sparks excels in the too-good-to-be-true genre. The book, in my opinion, was much better than the movie. Although the movie was good as well. 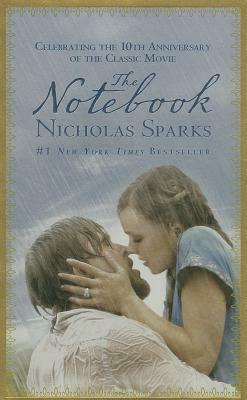 Nicholas Sparks' books tend to sound the same after a while, i'm sorry to say. But that wasn't the case with The Notebook, at all. Such an amazing story, I felt like crying tears of joy. Watching the movie first helps, though. The movie was beautiful. It helps paint a picture in your mind while reading and makes it all the better. I thought, as with all Nicholas Spark's books, it was extremely well written and heartwarming. This book was wonderful! It shows that love, though always tested, never fails. It shows a glimpse of how difficult and heart wrenching it is to deal with a loved one who has memories that fade due to age. Well written and absolutely one of his best!